The Treat-Eezi pressure relief pad delivers a soft, easy to use and cost effective way to treat those individuals who are susceptible to pressure sores, allowing them a restful and peaceful night’s sleep anywhere. Because of its size, the pressure sore bed overlay can be transported easily and in any travelling case allowing the user complete freedom, unlike many other products. The bed overlay offers 24-hour protection from bed to (foam based) chair using the same Treat-Eezi pad and offers the perfect cushion for pressure sores. The thousands of polyester fibres in the multiple layers of the Treat-Eezi pad combine to conform to the natural body contours in both supine and seated positions thereby offering pressure relief well below that of normal capillary blood flow. This means that skin breakdown, shearing and friction are simply diminished. Level 3 or 4 is recommend for patients who are 80kg or lighter but are particularly bony, as they will provide extra protection and comfort around joints. No pumps, electricity or power needed. We recommend purchasing the vapour permeable cover to go with your bed overlay. 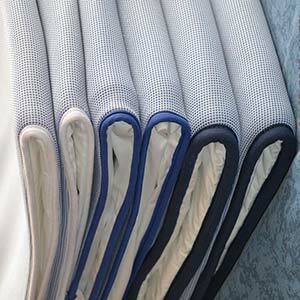 The cover will protect the overlay from any accidents and is machine washable for ease. The cover has been as thoughtfully created as the pad itself, using breathable materials that will prevent and treat pressure sores. You can select the pad cover from the drop down menu above and add it to your basket along with the pad. Use of the matching cover will increase the longevity of the overlay and keep it fresh and clean for longer.